This card-based game, a remake of the award-winning game Witch's Brew, combines luck and skill, and balances timely bluffing with clever hand management. Broom Service is a simultaneous-selection (but then sequential play) card game. Players select 5 of their 12 role cards to play per set, then they reveal them in sequence. Each role has a main full action and a less valuable "favor" action. If you are the first player with that role you announce that you are that character. If you follow after but choose that same role card you can take the favor action instead, or declare that you are that character in hopes that you can command the full action. You risk having it taken from you by a later player, though. The different roles help players collect different ingredients and money to make potions listed on the cauldron cards. When everyone's five role cards have been played and actions taken, another five cards are chosen for the next set and the process repeats as before. 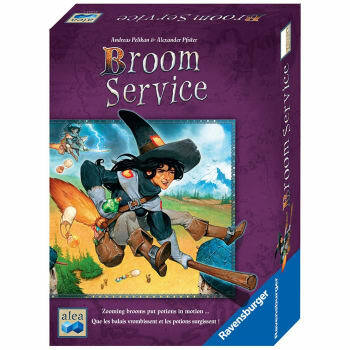 Broom Service is a revised and expanded version of Witch's Brew.